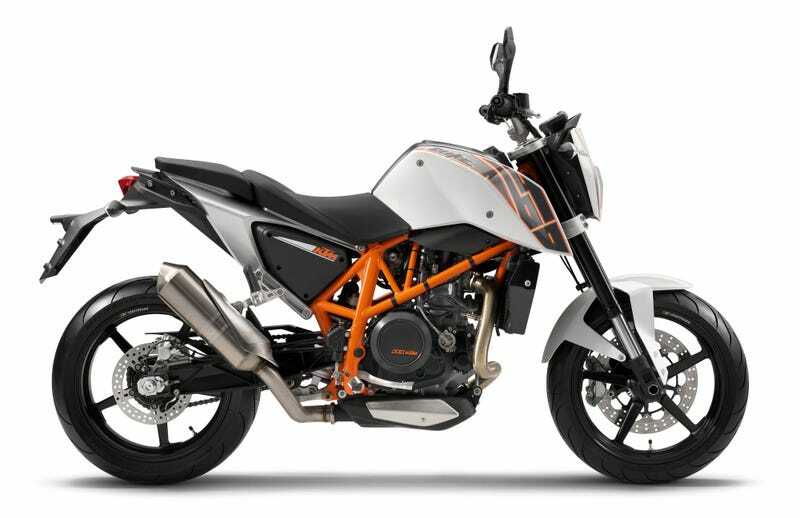 The KTM 690 Duke. KTM photo. Rumors of an 800 cc mill have been increasing over the last year or two from the Austrian brand, so much so that I was actually really disappointed last November when they weren’t released. Spy shots show the rumors were true, just my timing was a little off. The shots first showed up on UK site Visordown.com, but then Motorcycle.com found and posted several more of the “spy shots.” Good thing someone with a nice camera, long lens, had their camera set to shoot in burst mode. The “spy photographer” wants silly amounts of money to post the photos here, so head to the Motorcycle.com link for the pics. An 800-something cc twin would fit in perfectly between the small and almost supermoto-like 690 Duke and batshit bonkers 1290 Super Duke or 1190 Adventure. The former uses a massive single, while the latter all feature big V-Twins. The KTM 1290 Super Duke R. KTM photo. While this round of spy shots is of this new motor in a new Duke, their naked sportbike range, the bike I’m more excited about will be when a variant of this motor is used in some sort of smaller adventure bike. The 1190 is a great bike when the off-road conditions are good, but you feel all that weight pretty quickly. A smaller option would be incredibly versatile and useful for those of us who aren’t Chris Birch.